Atlas Geographique Compose de Sept Cartes. A very attractive an unusual c. 1848 jigsaw puzzle atlas published by Mr. J. G. Barbie du Bocage. 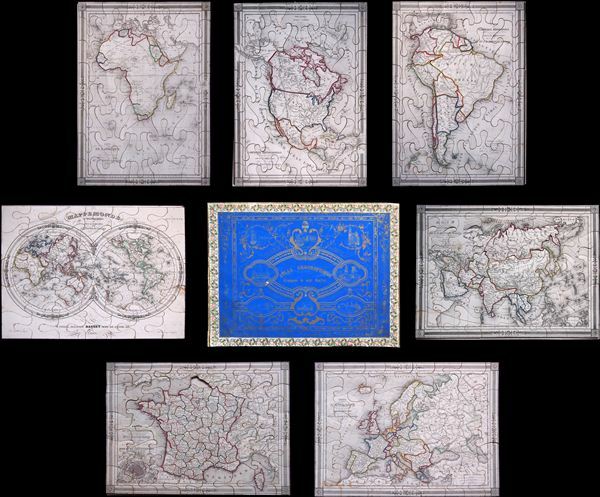 It consists of a custom box of seven interesting jigsaw puzzle maps: France, Europe, North America, South America, Asia, Africa and the World in Hemispheres. Each map is mounted on a board and dissected as a jigsaw puzzle. Countries and regions are individually dissected along their boundaries with their outlines in color, while oceans are dissected into more traditional jigsaw puzzle patterns. The world map is a beautifully drawn hemispherical projection. Antarctica is only tenuously denoted, reflecting the primitive state of exploration in the region. The map of South America covers the entire continent from the Caribbean Sea to Tierra del Fuego. It shows the Republic of New Granada, Ecuador, Venezuela, British, Dutch and French Guyana, Brazil, Peru, Bolivia, Chile, Patagonia, Republic of La Plata (Argentina) and Buenos Aires and the Falkland Islands. The Africa map exhibits the somewhat limited knowledge of Africa's interior in the early 19th century. Coastal areas are well mapped by the interior is somewhat vague. Various tribes are noted. The map of Asia covers from the Arabian Peninsula and Turkey eastward as far as Kamchatka, Japan, the Philippines and New Guinea. Shows Arabia, Persia (Iran), Hindostan (India), the Chinese Empire (including Tibet), the Russian Empire, Turkey (in Europe and Asia), Beloochistan, Afghanistan, Indochina (Burma, Thailand, Vietnam), Malaysia, Japan, etc. As this map was drawn, Imperial China wilted under the weak Qing Dynasty while the Russian attained the height of its pan-continental expansion. Turkey and the Middle East were under Ottoman rule. The sea between Japan and Korea, whose name, either the 'Sea of Korea' or the 'Sea of Japan,' is currently a matter of historical and political dispute between the two countries, is here identified in favor of Japan (Mer Du Japon). The France map covers the Kingdom showing its various departments. It includes Corsica and parts of the Austrian Empire, Switzerland and Belgium. An inset map on the lower left corner details Paris and its fortifications. The Europe map details all of Europe including Iceland as well as parts of Asia and Africa. It depicts the Austrian Empire at its height, the many states of the German Confederacy, and a pre Garibaldi Italy split into numerous small Duchies and states. Throughout, the maps identify various cities, towns, rivers and assortment of additional topographical details. The maps feature a beautiful frame style border. Puzzle maps like this were first made in London by John Spilsbury in the 1760s. The style passed to the continent and became a popular educational tool in France and Germany in the early to mid-19th century. While rare and often in poor condition, these curious maps and atlases are among the most amusing and whimsical geographic themed educational devices to appear in the 19th century. Generally very good condition. Wear and damage to box, especially at edges, with front panel of the box missing. Maps are in very good condition and generally complete. Minor damage to one piece in the Hemisphere map and a piece in the France map. France map missing the 'Nord' department piece. See photos.